NORWAY — A Norway woman is now speaking out after as a petition is requesting her dogs be removed from the premise or she move. “I wish somebody would walk by now so you could see what they do” said the dog owner, Jo-Ellen Basso. On Monday, September 3, Jo-Ellen Basso received notification from police about her dogs and their barking. She also got word that a petition was going around to make her move or give her dogs away. Basso says that her dogs are sweet, but they will bark at people they do not know or when people walk by her house. “If anybody in that three and a half years time would have came to me and said ‘you know, when you’re at work, your dogs bark a lot. Is there something you could do about it? It’s kind of annoying.’ I would have been like I’m so sorry, I would have done something to rectify the problem, but nobody in three and a half years has ever come to me” said the dog owner. 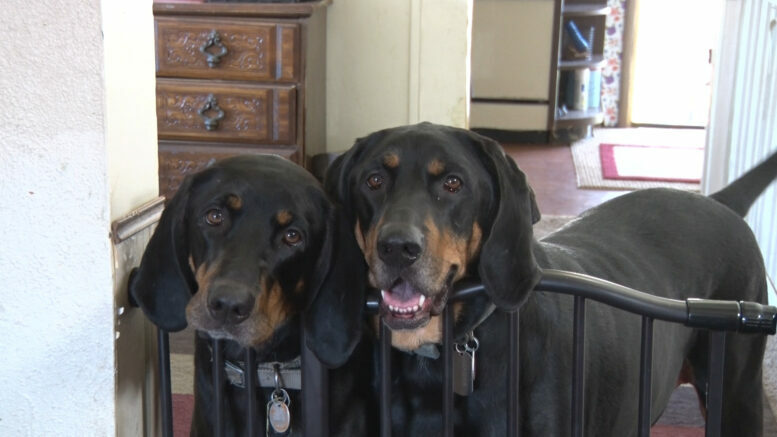 The dogs are black and tan coonhounds that she rescued and named Viktor and Vladimir. She said that this came out of the blue since all neighbors seem to like the dogs. ABC reached out to the Norway Police Department to learn more about how area cases relating to noise violations are often handled but they declined to comment.